The easiest dish in the world. Take your best-ever smoked mackerel as described here, and remove all bones and skin. 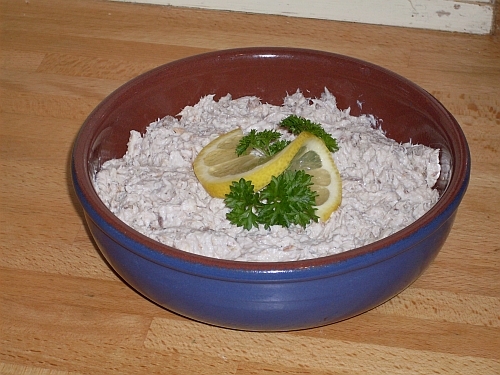 Mix with cream cheese (Philadelphia or supermarket equivalent) in a ratio of twice as much fish as cream cheese. Add lemon juice, salt and pepper to taste, but go easy on the salt and pepper until you have tasted it – your brine may have made the fish spicy enough already. Serve with toast fingers, or, if you really want to impress, make canapés with little circles of toast topped with smoked mackerel, a sliver of gherkin, and a sprinkle of fresh chopped parsley. Very posh.